Welcome to St. Mary’s Historic Site on Paca Street! 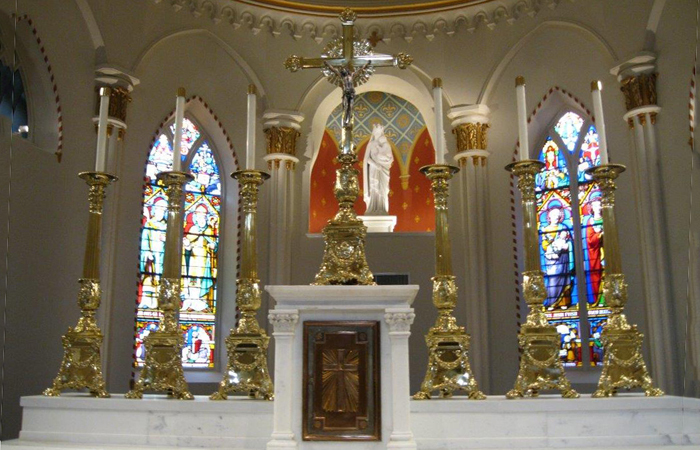 St. Mary’s Historic Site is a unique place, both in its history of the Catholic Church in the United States and in its contemporary spiritual ministry. Located at 600 North Paca Street, St. Mary’s Historic Site is home to two buildings on the National Register of Historic Places: the Mother Seton House and the Historic Seminary Chapel. The site is also home to St. Mary’s Spiritual Center. 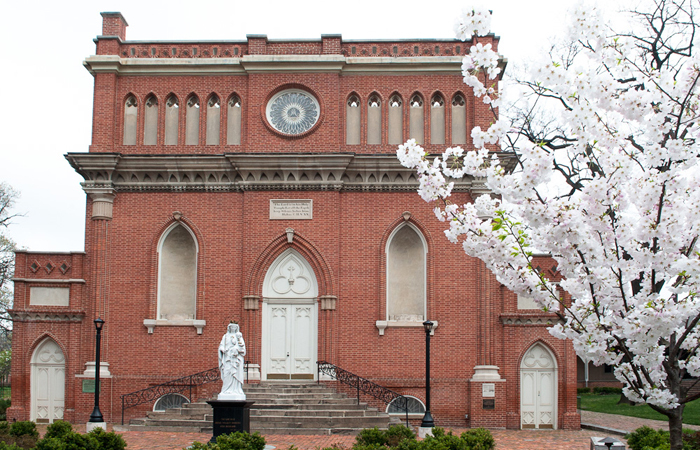 In 1791, at the invitation of Bishop John Carroll, the Sulpician Fathers arrived in the City of Baltimore and settled on this very site to begin the first Roman Catholic Seminary in the United States. Bishop Carroll knew of the Sulpician Fathers’ unique ministry of priestly formation from their ministry in France, and thus he invited them to come to his young diocese in the United States to do their ministry of priestly formation in this new land. The seminary, founded in 1791, was initially located in a building on the southeast corner of the property known as the One Mile Tavern. With the help of Bishop John Carroll and others, the Sulpicians were able to purchase additional property adjoining the One Mile Tavern and build St. Mary’s College and Seminary. The only remaining structure of the seminary is the Historic Chapel. 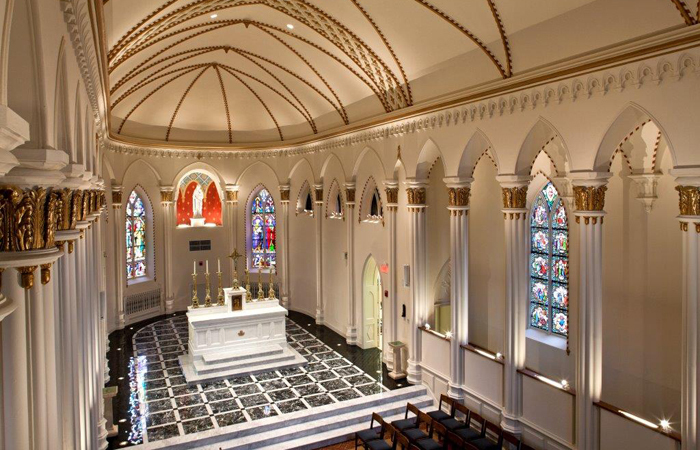 The building of the chapel began in 1806 and was completed and dedicated in 1808. 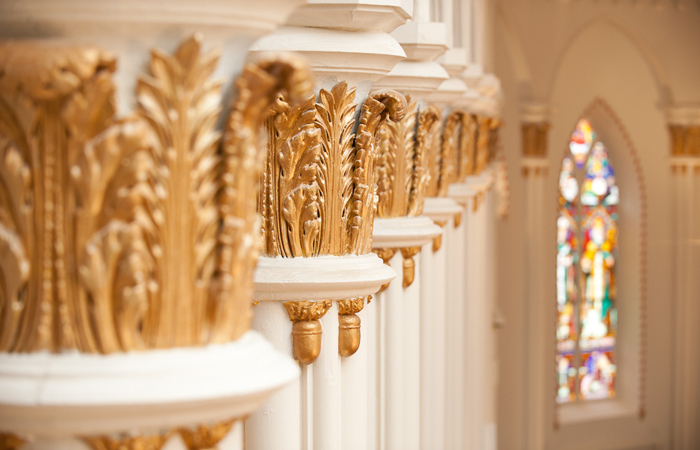 The chapel was designed by the renowned French architect Maximilian Godefroy, who himself was a friend of Benjamin Latrobe, often referred to as the Father of American Architecture. 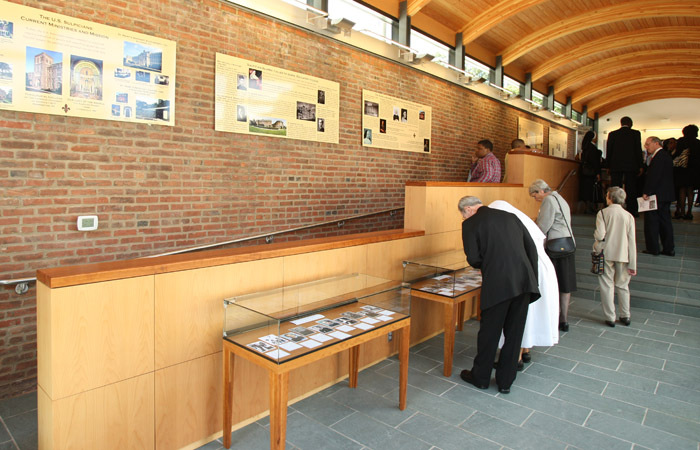 The chapel attracts architectural students as well as pilgrims to the site. 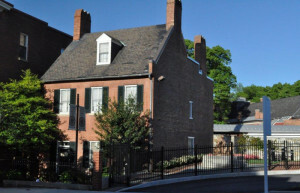 The other historic building located on the site is the of home of Elizabeth Ann Bayley Seton. In 1975, Mother Seton, as she is commonly known, became the first U.S.-born canonized saint within the Catholic Church. Mother Seton, a wife, mother, widow, convert, educator, and finally saint, offers a wonderful example of all that we can be with the grace of God. 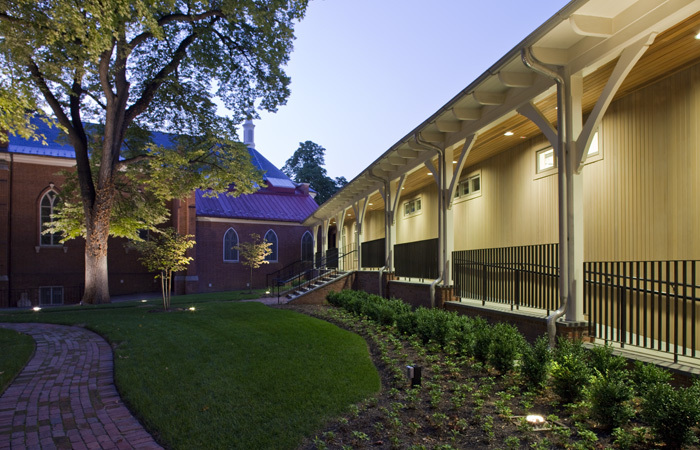 Mother Seton arrived at the Paca Street home the day of the dedication of the Seminary Chapel in 1808. She came to Baltimore at the invitation of Sulpician Father Louis W. DuBourg, who was then president of St. Mary’s College & Seminary. She, her three daughters, and several other girls called the Paca Street house their home for only one year, 1808 to 1809. During that year, she befriended a student at St. Mary’s named Samuel Cooper. Mr. Cooper, a man of resources, gave Elizabeth Bayley Seton eight thousand dollars with which she purchased St. Joseph’s Valley in Emmitsburg, Maryland. In 1809 she left her humble roots on Paca Street and began her 3-day journey to Emmitsburg. While in Emmitsburg, once again under the tutelage of the Sulpician Fathers, Mother Seton began her new ministry of Catholic education. It was Sulpician Father Dubois who welcomed her to Emmitsburg and helped her become established in her new home. 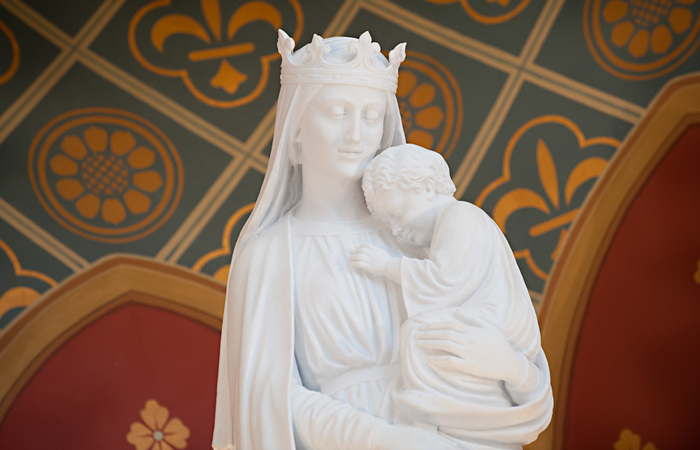 Her relocation to Emmitsburg was eased by the fact that the Sulpician Fathers were present as neighbors to her at Mount St. Mary’s College and Seminary, founded by the Sulpician Fathers in 1808. This institution and the presence of the Sulpician Fathers, gave great support and solace to the young widow and her dreams of founding a religious congregation and establishing a school for girls in Emmitsburg. 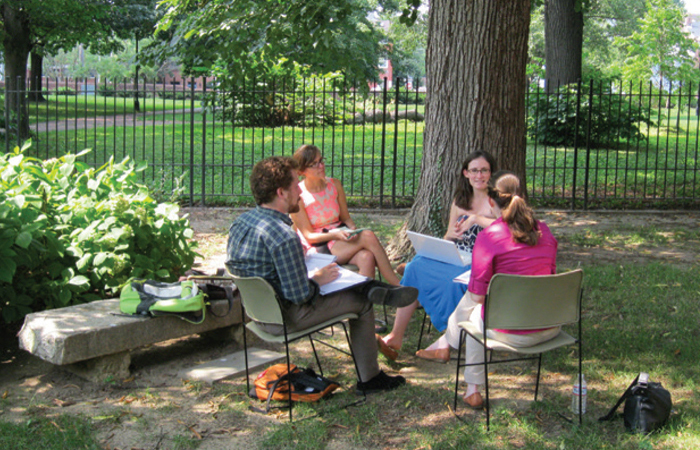 The first concern of St. Mary’s on Paca Street is the safety of our visitors, guests, and docents. Weekdays: If Baltimore County schools are closed, we will also be closed. Weekends: If Baltimore City has a Snow Emergency Phase in effect or severe weather conditions are predicted for weekends, we will be closed those days. St. Mary’s on Paca Street follows the Baltimore COUNTY school system procedures for inclement weather closings; if the COUNTY school system is closed, St. Mary’s on Paca Street will be closed on that day too. St. Mary’s on Paca Street, however, will be open normal times should the school system implement any delayed openings. Office Hours: 8:30 a.m-4:30 p.m. In light of the provisions of canon 903 CIC and canon 703 §1 CCEO, and the USCCB Dallas Charter (2002), Letters of Suitability are required in advance by all clergy, deacons, and religious when performing ministerial duties at St. Mary’s Spiritual Center & Historic Site, Inc., 600 N. Paca Street, Baltimore, MD 21201. St. Mary’s Spiritual Center & Historic Site, Inc.